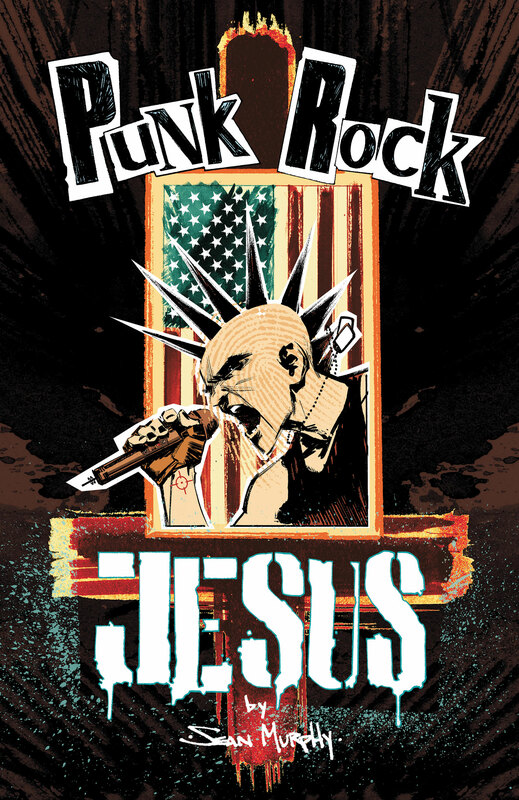 I’m not going to spend a lot of time reviewing Sean Murphy’s Punk Rock Jesus but here are a couple of thoughts. Good imagery but difficult to follow because of the lack of colour. To depict the dark and gritty future we are left with vast swathes of black in which we have to try and pick out the detail. In comparison, I just grabbed a copy of BPRD off my bedside cabinet and the many and varied shades of blue make for an easier read whilst keeping the gritty feel. Simon Cowell gives up on X-factor and makes a reality show out of the Turing Shroud by cloning Jesus. After fifteen years of staring in a morally bankrupt reality show Chris (the clone) breaks out to tell the world that “God is Dead”. Everyone dies. My main criticism is that this is a very one dimensional story. We see an ongoing battle between a caricature of US Christianity and a caricature of new atheism. At the end of the book, the author explains in his own words of how he was a Catholic who became an atheist and PRJ comes across as an out working of an internal angst. There isn’t so much a story on which arguments are hung but angry teenage angst with an absence of storyline. Anyone who knows me is aware that the most important thing I look for in any story is the development of the characters and their relationship with each other. Everything is a vehicle for the interplay of characters. Sadly, there was little in PRJ to appeal in this department. The villain is a pantomime villain. The ‘hero’ is a pantomime stroppy teenager. The martyr is quickly dismissed as a drunk. The most interesting character is the ex IRA bodyguard, Thomas. We get a good glimpse into his past life, his background in the IRA and haw that influenced him to this point. Sadly this is a small glimmer of character development. In some respects, I wish this story had been fleshed out over three or four times as many issues to give a storyline that had potential some room to grow. One aside about the theological worldview of this narrative: For a world with no overarching deity or “guiding power”, there is a surprisingly strong sense of an “inescapable fate”. It is as though the characters are being dragged to the end kicking and screaming by an external force. Thomas McKeal telling Chris that he was just the same as his opponents operating through “blind idealism”. No belly wheels. No stogie. Little storyline.